This weekend something big changed in my life, but I left it out of my weekend update because I wanted to talk about it with you, and honestly, it warrants it's own post. Well I guess I can say "he" because what I'm referencing is my grandfather passing away Saturday. As I type those words it's such a weird feeling. It's not that I am not sad about it, I am, I just don't feel like I've been emotional enough I guess. I've dealt with grief before, obviously, with my sister, but these things are so different. Yes, it's death either way, but he was in his 90s. He lived a full life and was such an amazing man. The fact that the world lost a great person, that I did, makes me sad, but in such a different way than my sister. I've never lost a person from natural causes before. Never because they got to live such a long, wonderful life. I'm not angry, like I was for a bit with Mallory, but I'm not terribly distraught either, like I feel like I should be, like other people are. This is my first grandparent gone and I'm more scared than anything. I feel like time moves so fast and I never stopped to consider that he wouldn't be there when I graduated or got married or had babies. I guess the thing that confuses me is that I've seen people grieve over their lost love ones before and I'm not reacting that way, I never really have. And I think it just brings up things I thought were done and gone and now I'm here dealing with it again. Is the amount you loved a person directly connected to how your grieve them? Is it weird that I've never really cried about either loss? I always thought the world would stop if one of my sisters or my parents died, but yet when that happened, it didn't. I still had life waiting for me. I sometimes feel bad, or like I need to apologize, for the fact that I don't cry every day about it. That I haven't fallen apart, like other people do. It scares me that people will think they must not have meant enough, but that's not it at all. I think I've just grown detached in a lot of ways as things have happened. I wish that I was a crier. I wish that for a day I was completely emotional about it, but it's never been that way, and I feel guilty about it to be honest. Is that normal to be relatively okay after people that you love die? I read these two quotes and they just really stuck out to me. Sometimes other people can say what you're thinking perfectly. I love this one. I hope that a piece of him is inside me somewhere. It's comforting to think that I maybe got a piece of that strength and courage and absolute goodness. He was such a good, loving person, and they just don't make 'em like that anymore. When I read this one, it made me feel like it was okay to be upset, if I needed to be. I always feel like it makes me selfish if I get angry that they're gone. That I wished for them to stay when they were scared and in pain. But when I read this it made me feel a bit better, because for me to want them back so terribly must speak volumes of how much I loved them, even if I can't properly show it. I guess all in all, I'm just a bit stunned right now. It's not that I'm not sad, don't get me wrong, I just wonder if I'm sad enough. I just worry that people will think less of them, or me, because I don't burst into tears when I think of them. And I also worry about my other grandparents and how much I need them to be there when I get married, and have babies, and my parents become someone's grandparents. I think losing someone for me doesn't make me appreciate time more, it makes me terrified of when there won't be any more time. And just like everything else, I don't know how to handle that, at all. Sarah, I'm constantly amazed at how strong you are. I lost my granddad almost seven years ago now, but I never really cried despite how close we were. It took me a long time to understand that it wasn't that I didn't miss him enough - because I do, every single day - it's just that I dealt with my grief in a different way. Thank you Amy. 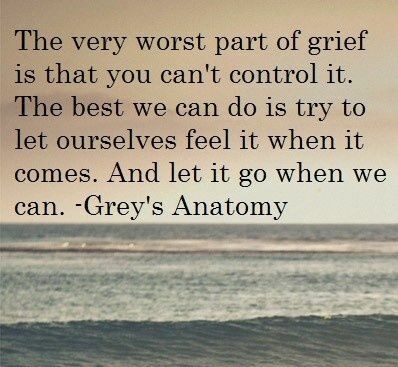 I think it's taken me a bit to understand as I've always seen people grieve so heavily and I've never been that way, but the more I accept that grieving isn't attached to how connected we were to a person, the easier it is to realize that everyone grieves differently and it's okay either way. Grief is a strange thing! I Love Big Books...and I cannot lie.